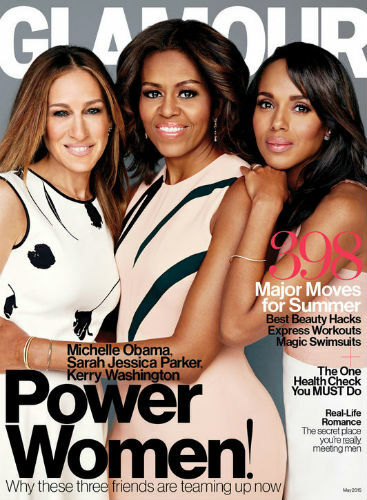 –Sarah Jessica Parker, Kerry Washington and Michelle Obama cover the latest issue of Glamour and talk about coming together to help veterans with PTSD. They also make fun of SJP’s old phone. -So it turns out that Star magazine was right about Emma Stone and Andrew Garfield splitting? People, E! and others are reporting they’re “on a break” — but maybe just because they’re working in different countries right now? It’s all very vague and heartbreaking. –Madonna wanders around a post-apocalyptic world in her new music video. I can’t stop staring at her face. She looks good for 56. Like, really, really good. -Meanwhile, Madonna tried and failed to premiere her new video with Terrence Howard on Meerkat. -OUCH! Nicole Kidman‘s Princess Grace of Monaco movie is debuting on Lifetime. -Rumours that Hollywood is planning a She’s All That reboot got Twitter all riled up last night, but it turns out the report may be premature. That’s ok; I just saw a great She’s All That reboot. It was called The Duff. -If the reboot ever does happening, I will totally ride for this fantasy casting. –Idris Elba thinks internet thirst ruined his chance to play James Bond. He’s probs not wrong. -Also, he posted this video about wrapping Luther season 4 and it ends with him tearing off his costume, so that’s something. -Ugh, Russell Peters‘ comments about Trevor Noah stealing his jokes were a “prank”? Gee, that doesn’t make the Canadian comedian seem like he’s trying to gain attention by riding the Noah controversy wave AT ALL. –Taraji P. Henson is channeling Empire’s Cookie in her SNL promos. –Taylor Swift and Lorde aren’t fighting, ok guys? –Mischa Barton is claiming that her mother Nuala Barton has been stealing her money and sabotaging her career. So that’s what happened. -This breakdown of Tom Cruise’s movie stunts, by a stuntman, is fascinating. I’m on board for the new Mission Impossible based solely on that trailer scene of him hanging out of the plane. -It’s hard to believe NBC, USA, Bravo, etc all passed on Lip Synch Battle, which is a big hit for Spike. Especially NBC, who is already in the Fallon business and is DESPERATE for a 1/2 hour hit. -If you’re ever in the hospital, it’s best to have a friend like Megan Mullally. –Amber Tamblyn wrote the best poem about Lindsay Lohan ever. -Despite every critic seeming to turn against it in the last few weeks, Fox has renewed Last Man Standing for season 2. –Kristen Stewart is stunning in her new Chanel eyewear ads. She’s making me want to chop off all my hair, which is never a good idea. -THR has a great breakdown of the CAA vs UTA battle of Hollywood agents. -Wait, so I have to pay $1.99 an episode to watch Stephen Amell drinking wine with his buddy? I mean, I will. But still. -Here’s the first trailer for Me and Earl and the Dying Girl, which won raves at Sundance. By all accounts, it’s a less sappy, more restrained version of The Fault In Our Stars.